MYPOCKET is a 2007 commission of New Radio and Performing Arts, Inc., (aka Ether-Ore) for its Turbulence web site. It was made possible with funding from the Jerome Foundation. 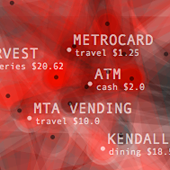 MYPOCKET discloses the artist's personal financial records to the world by exploring and revealing essential patterns in the daily transactions of his bank account. These are the records that we usually keep secret, whereas financial institutions intensively analyze them to score our credibility. Archived on the site, the artist's two years of spending history is analyzed by the custom software to predict future spending; these predictions sometimes determine his future choices, creating a system in which both the software and the artist adapt to one another. Influenced by today's techno-cultural milieu, MYPOCKET presents a hybrid interface to a living physical/digital process. 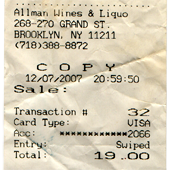 Marked receipts as physical manifestations of the predictions. Intensive network of transaction items existing in time. Streaming predictions and actualized transactions published daily. Requires a Java and Flash enabled browser and a choice of RSS reader for Transaction Feed. Best viewed on Firefox or Safari.